Muriel Cooper was brilliant, outspoken, and impish. She was a woman who will forever be admired not only for the precision and clarity of her print design, but also as the unconventional non-programmer who ushered in a new era of digital design. More than a half century after she designed the MIT Press colophon, it still sets the standard by which other logos are measured. 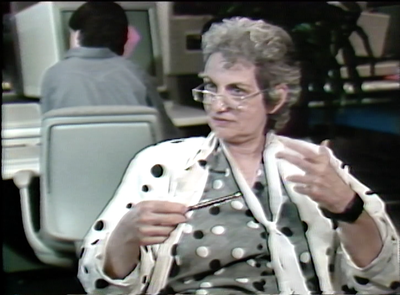 Her 3D digital information landscapes, presented at TED5 in 1994, wowed the audience–including Bill Gates–who asked for a copy of her presentation. We lost Muriel much too soon in 1994 at age 68, and can only imagine what more she could have given the world had she lived even a few years longer. She taught us all that the medium was not the message, and that true genius can be absolutely outrageous. On Thursday, October 19, the MIT Press and the MIT Media Lab co-hosted a program and reception to celebrate Muriel on the 50th anniversary of her becoming the first art director of the MIT Press. The day also marked the release of Muriel Cooper, the book by David Reinfurt and Robert Wiesenberger, published by the MIT Press.